Get location and contact information for cemeteries and memorial parks in Pittsburgh, Allegheny County and Southwestern Pennsylvania. Request information about a cemetery in Pittsburgh, PA from Rome Monument which has memorial showrooms located all over Southwestern Pennsylvania. The management staff at Rome Monument probably knows more about the cemeteries and memorial parks in Pittsburgh than virtually anyone. If you would like any type of information about a cemetery in the following Pennsylvania counties call us at 724-770-0100 or click here to request information about a cemetery in the Pittsburgh metropolitan area; Allegheny County, Mercer County, Armstrong County, Beaver County, Butler County, Fayette County, Greene County, Lawrence County, Washington County, Venango County, Clarion County, Crawford County and Westmoreland County. To choose the right cemetery, burial plot or memorial products it helps to talk to a Pittsburgh Cemetery Planning Advisor at Rome Monument. Rome Monument’s experienced Pittsburgh Cemetery Planning Advisors can answer all your cemetery burial and interment questions quickly and professionally and help you make the best decision. When considering cemetery options, consider factors such as location, the quality of the cemetery facilities, types of burial services offered, cremation options and location impact on plot pricing. A counselor can answer your questions quickly and professionally if you call 724-770-0100 or complete the online form. Rome Monument is one of the leaders in the cemetery monument and memorial industry. Get information on cemeteries and memorial parks in Pittsburgh including cemetery types, cemetery burial options, cemetery burial plots and prices. Since 1934, Rome Monument has been designing monuments, headstones and memorials that we deliver to, and install in, cemeteries in Pittsburgh. In Pittsburgh there are six basic types of cemeteries; veterans’ cemeteries, public cemeteries, green cemeteries (green or natural burial parks), religious cemeteries and municipal or district cemeteries. A sixth type of cemetery in Pittsburgh is called a historic cemetery and of course, there are "haunted cemeteries" in Pittsburgh. When people are trying to decide on where to purchase a grave or burial plot, it is important that they get information about how the cemetery grounds and monuments are maintained. Since 1934 Rome Monument has been designing and manufacturing custom monuments, memorials, headstones, gravestones, grave markers, tombstones, crypts, columbariums, mausoleums, granite memorial benches and flat/flush/lawn level bronze markers for families that have relatives interred and buried in cemeteries and memorial parks in Pittsburgh, Allegheny County and Southwestern PA.
For information about a cemetery or memorial park in Pitsburgh call 724-770-0100 or contact a Pitsburgh Cemetery Planning Advisor. Rome Monument engraves and inscribes names and dates on pre-existing monuments and headstones set in cemeteries and memorial parks in Pittsburgh. Rome Monument provides expert on-site engraving services for families who wish to update or upgrade their existing granite cemetery memorials. We typically perform our mobile lettering and engraving services to etch names and birth and death dates on companion/double headstones and family and estate monuments that memorialize more than one person. Call 724-770-0100 to request our on-site cemetery monument engraving service or click here. If you’re planning to arrange a burial or buy a monument, knowing cemetery rules and regulations in advance will likely save you time, money and anxiety. Every cemetery has its own set of rules and regulations governing how burials are conducted, monuments, park aesthetics, and many other matters. In fact, different sections of cemeteries often have different rules. Some sections within one cemetery may allow upright monuments, while others may not, for example. Before buying a plot, and before buying a monument or grave marker, be sure you have carefully reviewed your cemetery’s rules and regulations to ensure you understand how any rules and limitations may affect your memorial plans and objectives. We are familiar with the rules, standards, guidelines, policies and regulations at cemeteries and memorial parks in the following Pennsylvania counties; Allegheny County, Armstrong County, Beaver County, Butler County, Fayette County, Greene County, Lawrence County, Washington County and Westmoreland County. For information about rules, policies, standards, guidelines and regulations at cemeteries in Pittsburgh, PA contact Rome Monument at 724-770-0100 or click here. If your husband, wife, mother, father or sibling has chosen to be cremated, you can rely on Rome Monument to collaborate with your family to design and create a heartfelt cremation memorial that will adequately preserve their memory for years to come. Rome Monument sells, designs, creates and installs cremation memorials and monuments for families and cemeteries in Pittsburgh and Southwestern PA. In addition to specializing in cremation burial memorials, the folks here at Rome Monument are certified by the ICCFA (International Cemetery Cremation and Funeral Association) to administer, organize, and arrange cremations, and are fully qualified to explain the cremation process, cremation costs, burial and internment services, memorialization options and other important details that will empower you and help you make the right decisions when the time arrives. Click here to view pictures of cremation burial memorials and monuments we have designed in our Design Gallery. When planning a burial or interment and before your choose a cemetery in Pittsburgh, Allegheny County, or Southwestern Pennsylvania, it is important to understand and learn all your options well in advance of the actual passing of a loved one. Nowadays, reasons for choosing a new cemetery for family graves include monument, headstone and grave marker restrictions, cemetery locations, cost, the availability of cemetery space, the quality of the grounds management, changes to neighborhoods surrounding the cemetery and because the extended family has dispersed to live in different locations in Pittsburgh's environs. Families and individuals understand the importance of planning for cemetery space when a relative or they themselves are nearing the end of their life. Please feel free to call 724-770-0100 or click here to contact a Pittsburgh Cemetery Planning Advisor. When planning for your own final resting place or to bury your family members, please consider the following recommendations listed here. Learn how to find a historic or existing burial site, gravesite, burial plot, tomb, crypt, mausoleum, tombstone, headstone, interment location or grave in a Pittsburgh cemetery. People search for graves, burial sites and headstones in cemeteries in Pittsburgh for a variety of reasons including genealogy research. Some folks who have never visited the grave of a relative often try to locate the plot online. Amateur and professional genealogists use the online resources listed here to study a family's lineage and history. The resources listed here are used to find historic or personally important gravesites in cemeteries and memorial parks in Pittsburgh, Allegheny County and Southwestern, Pennsyvlania. The most efficient method of ordering a monument for a Pittsburgh cemetery is to schedule a design meeting at one of our showrooms. Learn how to order and purchase a monument or grave marker for your family that will be installed in a cemetery or memorial park in Pittsburgh, PA.
We supply families, cemeteries and funeral homes with custom designed cemetery monuments and memorials in the following Pennsylvania counties; Allegheny County, Armstrong County, Beaver County, Butler County, Fayette County, Greene County, Lawrence County, Washington County and Westmoreland County. If you or your family is interested in buying a monument that will be installed in a cemetery in Pittsburgh, Rome Monument is your best choice. To place a purchase order for a monument, headstone, gravestone or memorial that will be installed in a cemetery or memorial park in Pittsburgh, call Rome Monument at 724-770-0100 or review the information listed here. Learn how and where to purchase a cemetery lot or burial plot for traditional ground burials or cremation burials in a cemetery in Pittsburgh, PA. Understand the basics of purchasing the following; burial lots, graves, gravesites, burial spaces, columbarium niches, burial space, grave space, grave plots, family plots, cemetery lots, vaults, mausoleums or mausoleum niches, crypts and cemetery property. Learn about the different aspects of purchasing burial space for cremated remains (cremains) in Pittsburgh cemeteries and memorial parks. Learn about different types of burial plots for sale in Pittsburgh including single plots, companion plots, family or estate plots and plots for cremated remains. To request assistance with buying a burial plot or cemetery space in Pittsburgh cemetery, call 724-770-0100 or click here to talk with a Pittsburgh Cemetery Planning Advisor. Prices to purchase burial plots and gravesites in cemeteries in Pittsburgh, PA typically range from $500 to $3,000 per space. Get more information. Find private individual plot owners selling burial plots on "Buy and Sell" and Exchange websites. Cemeteries also charge fees for "opening and closing" the grave, "perpetual care" and foundations for monuments. In situations where Rome Monument is not installing the memorial, monument or grave marker, cemeteries may charge an installation fee. If you would like more specific information about prices for burial plots in Pittsburgh cemeteries or memorial parks, call Rome Monument at 724-770-0100 or click here to contact a Pittsburgh Cemetery Planning Advisor. Learn how and where to buy burial plots, columbarium cremation niches, cemetery plots and spaces located in Pittsburgh cemeteries that are for sale. In Pittsburgh, Pennysylavnia, most burial plots for sale are purchased directly from a cemetery or memorial park. The actual burial plot purchase transactions normally take place in an administrative office on the cemetery grounds or nearby. Burial plots that are for sale and are located in church cemeteries around Pittsburgh are typically purchased from a Catholic, Christian, Orthodox or Jewish religious organization or congregation. Individual plot owners also put cemetery property for burials up for sale, typically at lower prices than those charged by cemeteries and memorial parks. Rome Monument, one of Pittsburgh's oldest monument companies, has been working with the burial plot sales representatives and management staff at cemeteries and churches in Pittsburgh since 1934. If you are looking for a burial plot for sale in Pittsburgh, we know the seller's names, addresses, phone numbers and in some cases, their email addresses. If you are looking to buy a burial plot or cemetery space in the Pittsburgh metropolitan area, contact Rome Monument at 770-724-0100 to discuss your options. 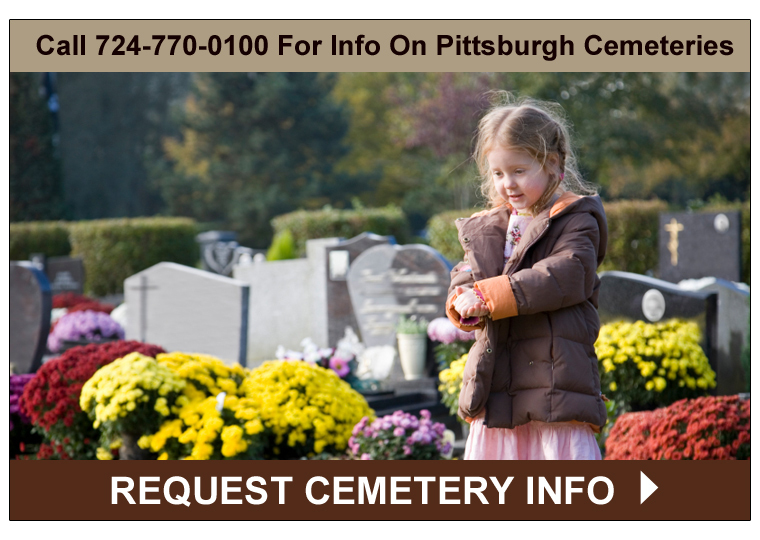 Click here to contact a Pittsburgh Cemetery Planning Advisor. Learn how to find and access cemetery records, burial records and interment records that designate the gravesite of a person interred in a cemetery in Pittsburgh. Use the online resources to research cemetery records in Pittsburgh to find a burial site, gravesite, burial plot, tomb, crypt, mausoleum, tombstone, headstone or grave in a cemetery or memorial park in Pittsburgh, Pennsylvania. Official cemetery records are used to locate gravesites and evidence and accounts of burials and interments. Most cemeteries in Pittsburgh and Allegheny County Pennsylvania permanently record the names of people interred along with dates and the location in the cemetery where there gravesite is located. Genealogists use cemetery records as a resource during their research as one piece of evidence to determine what occured in a families history or lineage. Families and indiviudals use cemetery records to locate a family plot or the cemetery lot so that they can visit and pay their respects to the deceased. Rome Monument helps to restore, preserve, maintain, repair and protect historic and working cemeteries in Pittsburgh on a contract and volunteer basis. Our staff knows how to precisely repair cracked and broken historic and current headstones, statues, tombstones, crypts and mausoleums. We can level monuments, secure unsteady memorials and stabilize historic cemetery structures and gravestones. It is our firm belief at Rome Monument that distinctive older cemeteries should be treasured, restored and maintained whenever possible. Rome Monument is always willing to do it's part to preserve the historic records contained in the inscriptions on pioneer tombstones located in old cemeteries in Pennsylvania and Pitttsburgh. We also do what we can to restore and preserve church cemeteries in the Pittsburgh area. Options for making cemetery arrangements for interments, traditional ground burials, cremation inurnments and natural and "green" burials in the Pittsburgh area. We will be happy to answer questions you have about the different types of burial choices families in Southwestern Pennsylvania can make. Click here for contact information for cemeteries in Pittsburgh. Click here to view pictures of monuments and memorials that were designed and built by Rome Monument that are now located in cemetery in Pittsburgh. Learn about interment and memorialization options for traditional and cremation burials in cemeteries in Pittsburgh, PA. Families and individuals in the Pittsburgh area are increasingly choosing cremation burials over traditional burials for a variety of reasons. What many people don't realize, however, is that the memorialization process does not have to be any different when a person has been cremated. Most cemeteries in Pittsburgh permit cremated remains to be interred in their cemetery. In many cases, the final disposition of cremated remains in a cemetery is more affordable than with a tradional ground burial. Rome Monument offers a wide selection of cremation memorials. Get ideas for things to do when you visit the grave of someone special to you. Understand why and when to visit the gravesite of a loved one. Here are some suggestions about what you can do when visiting a family gravesite. If you visit a gravesite with your family, there are many memories you can share together. There are the special times when people are more likely to go to a cemetery or memorial park to visit the grave of a loved one.